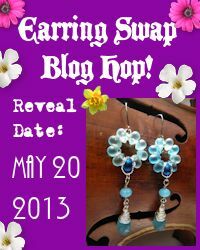 Thank you to Kelly Rodgers of Beadin’ Black and Blue for hosting this blog hop. We were supposed to be inspired to make something (jewelry or art) based on our favorite song. Naming a favorite anything is difficult for me. I always joke I could give a different answer every five minutes, but it’s true. The title she came up with for the hop actually helped me. I am a huge David Lynch fan, even though he has been accused of misogyny (a good argument could be made) and portraying violence against women (fair enough). In 1997, the Smashing Pumpkins released a song called Eye on the soundtrack to the David Lynch film Lost Highway. At the time, I listened to this obsessively in my car on my commute. I saw the Smashing Pumpkins open for Kiss in 1998 on Halloween. I have to admit to not being a huge Smashing Pumpkins fan, but there are personal reasons for that, which is just part of living in Los Angeles. There has been some debate about what this song is about, but for me it seems a meditation on spirituality leaning towards Deism. You decide. Obviously, I’m not a Deist, but I like songs that make me think and there is something mesmerizing and tortured about Eye. “Just a touch” reminds me of The Creation Of Adam by Michelangelo. For thousands of years the Eye has been a symbol of light, protection from evil, elevated consciousness, God(s) watching over creation or omnipotence, clairvoyance, and the gateway to the soul. The Third Eye, Ajna (the Hindu God Shiva has three eyes, the middle eye is the possessor of all knowledge which when opened will destroy anything it sees) is responsible for spiritual enlightenment and is called the “seat of the soul.” The Eye of Horus, and the Eye of Ra are Egyptian and there are numerous Goddesses associated with the Eye in that belief system. The symbol of the hand appears in Kabbalistic manuscripts and amulets, doubling as the Hebrew letter “Shin”, the first letter of “Shaddai”, one of the names referring to God. 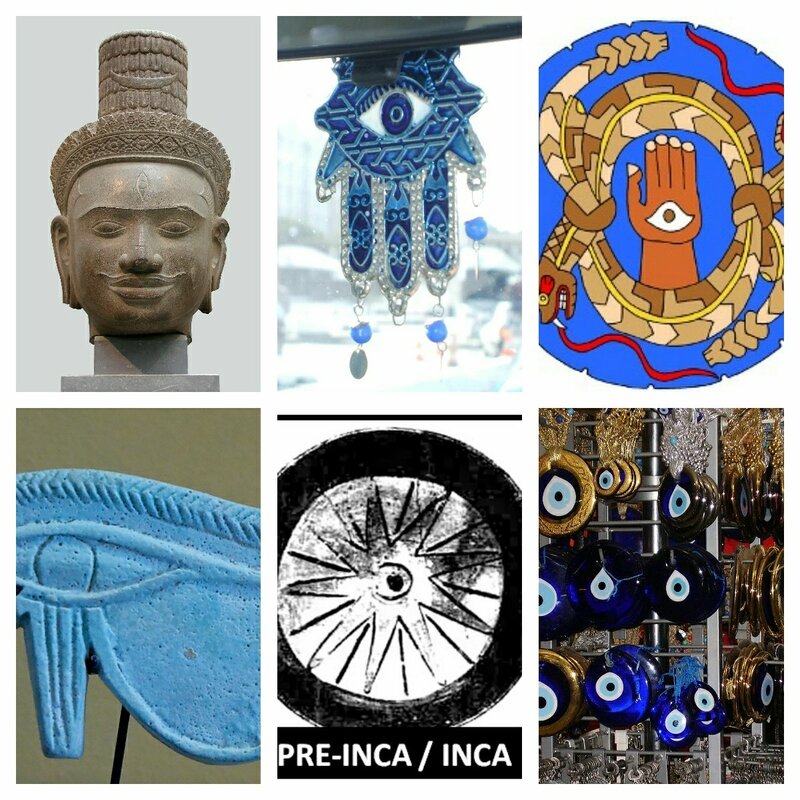 The Hamsa, or the Eye of Fatima is still used in the Middle East/Asia/Northern Africa. The Nazar of Greece/Turkey is just the eye itself. The symbolism also appears in Aztec, Mayan, and Native American iconography. The “all seeing eye” of God, also known as the Eye of Providence, watches over the deeds of humanity. Although I could have gone in many directions colorwise, Indigo is the most obvious choice. I did use some for the Third Eye or Brow Chakra, but I also used Violet for the Crown Chakra. With these two colors we move from seeing the truth, to knowing that everything is connected (pure consciousness). I set the resin pendant made by Andrew Thornton of Allegory Gallery in a cloud of copper with brass prongs. 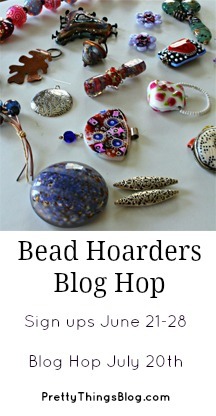 The beads I used are from all over the world and are both vintage and modern. 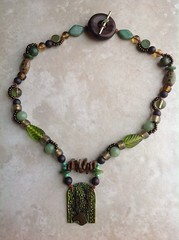 Many of the beads used in the chain are also from Allegory Gallery. I also have about three boxes of vintage Italian, German, and Japanese lucite and acrylic beads I have collected over many years now so I picked through those. I supposedly got the last star pendant Andrew made, but maybe you can sweet talk him into making more! This was meant to be a gift, but I may have a hard time letting it go even though it is not perfect. I am pleased with it. 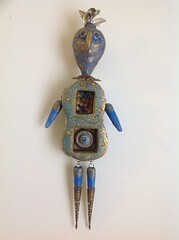 This entry was posted in Blog Hops, ruminations, Uncategorized and tagged Allegory Gallery, Andrew Thornton, Beadin Black and Blue, Deism, Eye by Smashing Pumpkins, Eye symbolism, handmade, vintage lucite, windbent. Bookmark the permalink. What a beautiful and meaningful piece, Lennis. I love how you thought out every detail. Love your colors and unique style. Your level of detail is outstanding. Okay first I have to tell you that it cracks me up that when I try to say your name into Google talk it calls you lettuce. LOL! Anyway I just want to tell you this piece is really beautiful I love the colors you chose and I love the eye. You did a phenomenal job! And by the way I love the Smashing Pumpkins…well a lot of their songs anyway. I still can’t figure out what you were so stressed about, this piece turned out really great – I love how there is such a feminine side to it and yet kind of creepy! By now I guess you know that I love that kind of thing. I think maybe we have similar taste?! Lol! I am so glad that you decided to participate on this one. Thank you so much for joining in! I have been called a lot of things, lettuce doesn’t even make the top ten of worst things. I had some technical issues with this piece and a metalsmith would know it, but I am trying to not tear apart my pieces because what I say about them affects how people view them an who I am to tell someone that it’s crap if they like it? Yes, I like the end product, but I am trying to be less negative about my mistakes and learning curve. Since I am not selling pieces, I can let some less than perfect pieces out into the world. I can gently say, I won’t do that again or I wouldn’t use that produce again. Smashing piece (see what I did there lol? ), yes really! I love the focal and how you set it into a cloud, and the colour scheme is right up my alley. Gorgeous! Beautiful piece. Love the eye. 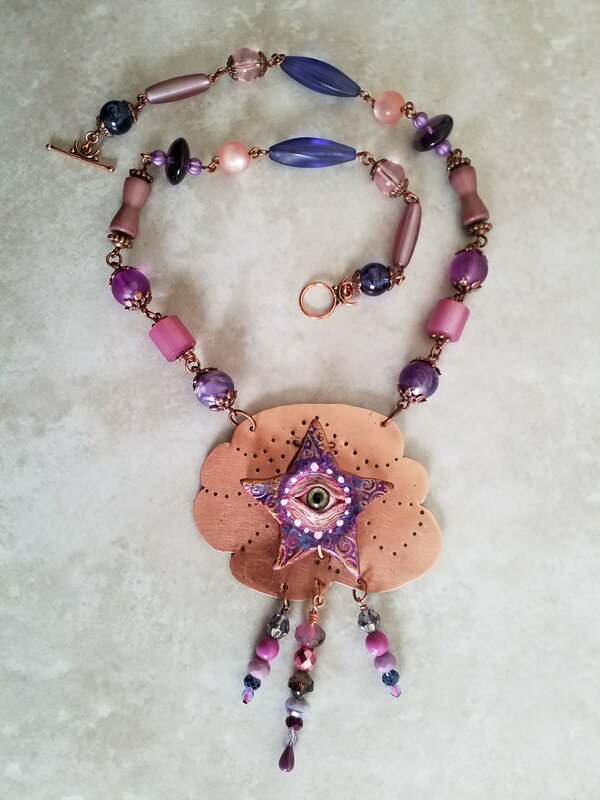 The beads you selected go perfectly together and the copper piece makes the eye pop. 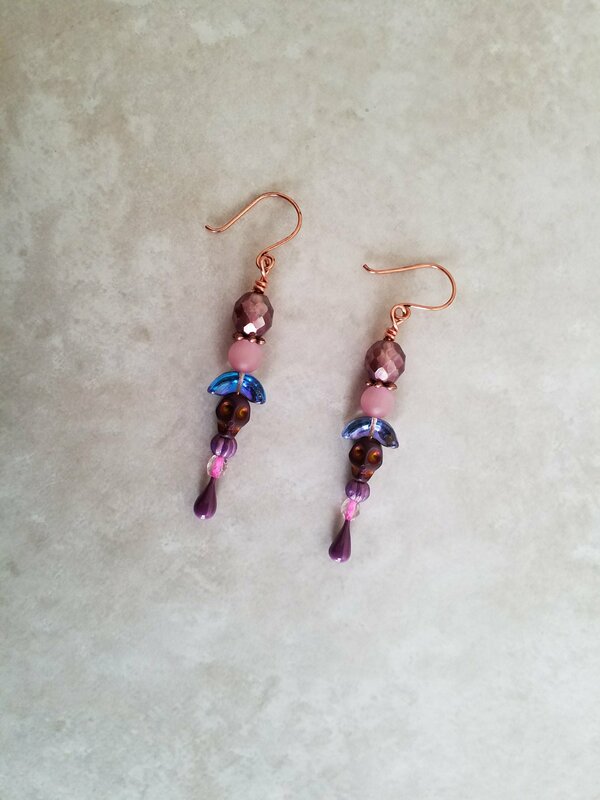 Ok, I loved the Brow chakra beads sitting right above the skulls, I had to look close but when I did, it kind of grounded the whimsy of the colors, and made it much more complex, in my mind. I really liked the symbolism you chose, and when I closed my eyes and listened to the actual music of the song, it sounded very much like shifting sands, which is kind of the feel that I get from all the colors together. the three dangle beads coming from the cloud remind me of the “All seeing eye” motifs around, and it was really cool seeing the layers of symbolism you used. I love these pieces! I’m super late replying to this, apologies! But I adore this: the color choices, the thought behind everything, the end results. Also, David Lynch. Gorgeous! Especially fond of the eye.